Announcing the latest variegated acer, sure to become a hit with its uniquely coloured foliage. Introducing Acer palmatum 'Shirazz', a striking Japanese maple that's something a little more out of the ordinary. With an astonishing kaleidoscope of colour changes, this is a new and spectacular variety of variegated maple. Year round interest with colourful foliage and intersting winter shape when dormant. 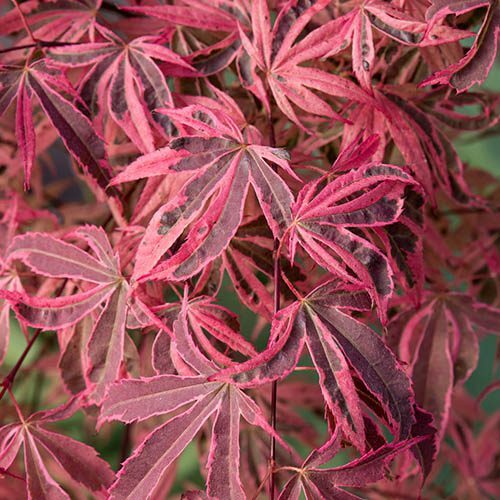 Preferring a position in shade or in lightly dappled shade, Acer Palmatum 'Shirazz' is a robust and vigorous grower, establishing relatively quickly. Perfect as a specimen tree and supplied as an established plant in a 3L pot, you can expect 'Shirazz' to reach a maximum height and spread of 2.5 metres. Introducing Acer palmatum 'Shirazz', a striking Japanese maple that's something a little more out of the ordinary due to its unusually variegated leaves which will bring a touch of calming Zen to your garden. With an astonishing kaleidoscope of colour changes, the attractive foliage unfurls pink, maroon and green during spring, in summer its leaves take on more muted tones becoming green with cream variegation and pink leaf tips and in autumn takes on a rosy glow as it turns vibrant red and purple. A new spectacular new variety of variegated maple, this compact tree is also known as Gwen’s Rose Delight, the smallish attractive leaves are long, slender and deeply divided, generally having five lobes pointed at the tips. Preferring a position in shade or in lightly dappled shade, Acer Palmatum 'Shirazz' is a robust and vigorous grower, establishing relatively quickly. It tends to have an upright growth habit and as the tree matures, the branches take on a gently weeping form giving a beautiful, arching effect which shows off the coloured leaves perfectly. Perfect as a specimen tree you can expect 'Shirazz' to reach a maximum height and spread of 2.5 metres.